The lead single, "Rosanna", peaked at number 2 for five weeks on the Billboard Hot 100 charts, while the album's third single, "Africa", topping the Hot 100 chart, became the group's first and only number 1 hit. Both songs were hits in the UK as well, reaching number 12 and 3, respectively. The fourth single, "I Won't Hold You Back", also peaked within the top ten on the Hot 100, at number 10, but atop the Billboard Adult Contemporary charts for three weeks. It also went into the top 40 in the UK. With the success of "Africa", the album climbed back into the top 10 in early 1983 on both sides of the Atlantic. Toto IV received six Grammy Awards in 1983 including Album of the Year, Producer of the Year for the band, and Record of the Year for "Rosanna". It reached number four on the Billboard 200 album charts in the United States, shortly after its release. It also reached the top ten in other countries, including Canada, Australia, New Zealand, the Netherlands, Italy, Norway, the United Kingdom, and Japan. After the success of their self-titled debut, Toto struggled to sustain success on their next two albums, Hydra and Turn Back. The band was under heavy pressure from Columbia Records to deliver a hit album with their next release or be at risk of being dropped from the label. The band went back to the formula that helped them succeed on their first album, having an album that touched on many different genres of music. They also utilized many outside musicians to help give the sound a more polished, fuller feel than they had on past albums. The recording took many months during 1981 and 1982 and the band was allowed a much larger than average recording budget. At a time when most bands were using a single 24-track recorder Toto used as many as 3 separate 24-track recorders at the same time. The 24-track recorders were linked with a computerized SMPTE timecode system that allowed for up to 69 individual tracks of sound simultaneously. This was the final album with the original Toto lineup. David Hungate, who moved to Nashville during the recording of the album, left the band to spend more time with his family. Two years later, prior to beginning recording of their follow-up album, Bobby Kimball was fired by the band due to drug issues that were damaging his voice. The band delayed touring after the release of the album to instead help in the production of Michael Jackson's Thriller album, as well as collaborating on Chicago's comeback album Chicago 16 that same year. Philip Garris's original emblem from the Toto album was updated to show four rings since this was their fourth album. The newer looking, well-polished ring around the hilt of the sword represented their latest work. Each successive ring showed a little more wear and a few more chips which represented the band's previous records. 9. "Waiting for Your Love"
David Paich – keyboards, lead and backing vocals, orchestral arrangements on "I Won't Hold You Back" and "It's a Feeling", horn arrangements on "Rosanna"
Steve Lukather – guitar, lead and backing vocals, piano on "Good For You"
Steve Porcaro – keyboards, lead vocals on "It's a Feeling"
James Newton Howard – orchestral arrangements and conductor on "I Won't Hold You Back", "It's a Feeling", "Afraid of Love" and "Lovers in the Night"
Tom Scott – saxophone on "Rosanna" and "Lovers in the Night"
Lenny Castro – percussion and congas on "Rosanna", "Good For You", "It's a Feeling", "Lovers in the Night" and "Africa"
Joe Porcaro – percussion on "It's a Feeling" and "Africa", xylophone on "Afraid of Love", tympani on "Lovers in the Night", marimba on "Africa"
Ralph Dyck – synthesizer on "Lovers in the Night"
The Martyn Ford Orchestra – strings on "I Won't Hold You Back", "It's a Feeling", "Afraid of Love" and "Lovers in the Night"
Gary Grant – trumpet on "Rosanna"
Jerry Hey – trumpet and horn arrangements on "Rosanna"
James Pankow – trombone on "Rosanna"
Jim Horn – saxophone on "Rosanna" and "Lovers in the Night", recorders on "Africa"
Tom Kelly – backing vocals on "Rosanna" and "Make Believe"
Marty Paich – orchestral arrangements on "I Won't Hold You Back"
Roger Linn – synthesizer programming on "Good For You"
Mike Porcaro – cello on "Good For You"
Timothy B. Schmit – backing vocals on "I Won't Hold You Back", "Good For You", and "Africa", acoustic guitar on "Africa"
Jon Smith – saxophone on "Make Believe"
^ William Ruhlmann. "Toto IV - Toto - Songs, Reviews, Credits, Awards - AllMusic". AllMusic. ^ "Robert Christgau: CG: Toto". robertchristgau.com. ^ a b Toto USA chart history, Billboard.com. Retrieved September 10, 2011. ^ a b Toto UK chart history Archived 2013-06-16 at WebCite, The Official Charts. Retrieved September 10, 2011. ^ Classic Tracks: Toto's "Africa", Mix Online. Retrieved June 30, 2015. ^ "Darrin Matteson – In terms of two, The amazing similarities between Chicago and Toto". Retrieved 2011-12-01. ^ Nielsen Business Media, Inc (1982-03-26). Billboard.com - Hits of the World. Retrieved 2012-01-29. ^ Hung Medien. "dutchcharts.nl Toto – IV". dutchcharts.nl (in Dutch). MegaCharts. Archived from the original (ASP) on 2012-10-19. Retrieved 2012-03-03. ^ "InfoDisc : Tous les Albums classés par Artiste > Choisir Un Artiste Dans la Liste" (in French). infodisc.fr. Archived from the original (PHP) on 2012-06-16. Retrieved 2012-03-03. ^ a b "Hit Parade Italia - Gli album più venduti del 1982" (in Italian). hitparadeitalia.it. Retrieved 2012-03-03. ^ "charts.org.nz Toto – IV". Hung Medien. Recording Industry Association of New Zealand. Archived from the original (ASP) on 2012-11-13. Retrieved 2012-03-03. ^ "norwegiancharts.com Toto – IV". Hung Medien. VG-lista. Archived from the original (ASP) on 2012-10-24. Retrieved 2012-03-03. ^ "swedishcharts.com Toto – IV" (ASP) (in Swedish). Retrieved 2012-03-03. ^ "Chart Stats - Toto – IV" (PHP). UK Albums Chart. Retrieved 2012-03-03. ^ "allmusic ((( Toto IV > Charts & Awards > Billboard Albums )))". allmusic.com. Retrieved 2012-03-03. ^ "Album Search: Toto – IV" (in German). Media Control. Retrieved 2012-03-03. ^ "Top 100 Albums '82". RPM. 1982-12-25. Retrieved 2012-03-03. ^ "Dutch charts jaaroverzichten 1982" (in Dutch). Dutchcharts.nl. Archived from the original on 2014-05-12. Retrieved 2014-04-30. ^ "Les Albums (CD) de 1982 par InfoDisc" (in French). infodisc.fr. Archived from the original (PHP) on 2012-12-29. Retrieved 2012-03-03. ^ "Billboard.BIZ: Top Pop Albums of 1982". billboard.biz. Archived from the original on 2013-01-15. Retrieved 2014-04-25. ^ "RPM Top 100 Albums of 1983". RPM. Retrieved 2012-03-03. ^ "Complete UK Year-End Album Charts". Archived from the original on 2012-05-19. Retrieved 2012-03-03. ^ "Billboard BIZ: Top Pop Albums of 1983". billboard.biz. Archived from the original on 2012-12-31. Retrieved 2014-04-25. ^ "Canadian album certifications – Toto – IV". Music Canada. Retrieved 2012-03-03. ^ a b "Toto" (in Finnish). Musiikkituottajat – IFPI Finland. Retrieved 2012-03-03. ^ "Les Albums Platine". infodisc.fr. Syndicat National de L'Édition Phonographique. Archived from the original on 2012-10-23. Retrieved 2012-03-03. ^ "French album certifications – Toto – IV" (in French). Syndicat National de l'Édition Phonographique. ^ "Gold-/Platin-Datenbank (Toto; 'IV')" (in German). Bundesverband Musikindustrie. 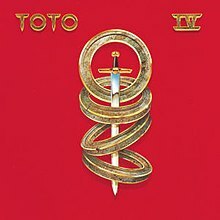 ^ "Japanese album certifications – Toto – Toto IV" (in Japanese). Recording Industry Association of Japan. ^ "Dutch album certifications – Toto – IV" (in Dutch). Nederlandse Vereniging van Producenten en Importeurs van beeld- en geluidsdragers. Retrieved 2011-09-03. Enter IV in the "Artiest of titel" box. ^ "British album certifications – Toto – IV". British Phonographic Industry. Retrieved 2012-03-03. Select albums in the Format field. Select Gold in the Certification field. Type IV in the "Search BPI Awards" field and then press Enter. ^ "American album certifications – Toto – IV". Recording Industry Association of America. Retrieved 2012-03-03. If necessary, click Advanced, then click Format, then select Album, then click SEARCH.